In the summertime, the fresh fruit that's available just makes me dream of pies, crumbles, buckles, and desserts galore. So I set my sights on this blackberry cobbler, and I was not disappointed. 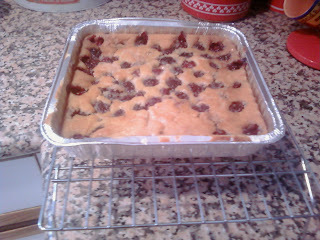 One of the things that drew me to this recipe was that it called for you to do the mixing in the very pan you bake it in. Amazing! Recipes that actually cater to laziness. I'm in heaven. ...with these babies. The recipe calls for you to let the 2 1/2 cups of blackberries in 1/2 to 1 cup of sugar for ten minutes before adding them. After reading through a lot of the comments on recipezaar, I decided to add a little sugar to the batter as well, and then used about 3/4 cup of sugar with the blackberries. 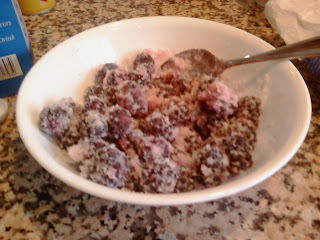 However when I added the berries to the batter, I had a lot of sugar left over in the bottom of the bowl. I sprinkled a little over the top and discarded the rest. ....and it was good. Truth is, I'm not really sure exactly what a cobbler is, but after some googling, it appears to be a biscuit like dough with fresh fruit on top, and the dough rises and covers the fruit. I guess that's what happened here, but either way this was a winning dish with almost no clean up! Tip of the Day: Most berries grow mold easily, so use fresh ones within a day or so, or freeze them. Also don't wash them until you're about to eat or use them - they're more likely to go moldy when wet. 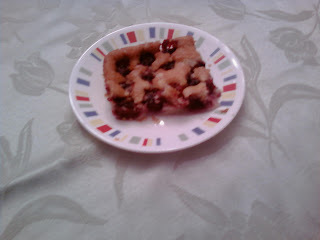 Mix blackberries and 1/2 cup of sugar, and let sit for 20 minutes or until fruit syrup forms. 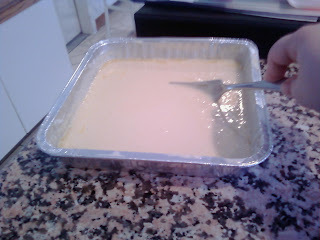 Mix together flour, baking powder, salt, milk and 1/4 cup of sugar in ungreased 8 inch square pan. Stir in melted butter until blended. 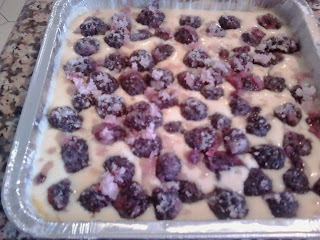 Spoon blackberries evenly over the batter. Sprinkle some of the excess sugar on top. Bake at 375 degrees for 45-55 minutes or until dough rises and is golden.